The Holy Family School started in 1998 at the initiative of priests and laity with the aim of making a contribu- tion to society and education according to Fr Kentenich‘s pedagogy. 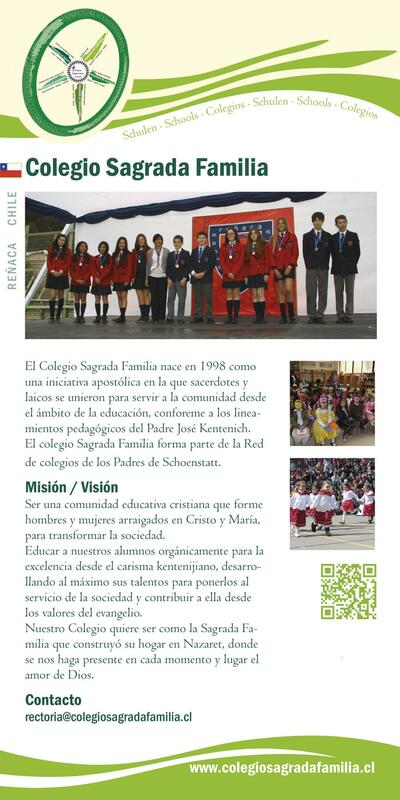 The Holy Family School in Reñaca, Chile, is part of the net- work of schools run by the Schoenstatt Fathers. To train a Christian educational community of men and wo- men who are able to change our society. Our concern is the holistic education and formation of our students and the greatest possible training of their abilities. Our students take their bearings from the Biblical background of the life of the Holy Family of Nazareth, and want to make it possible for others to experience a similar family-like atmo- sphere.